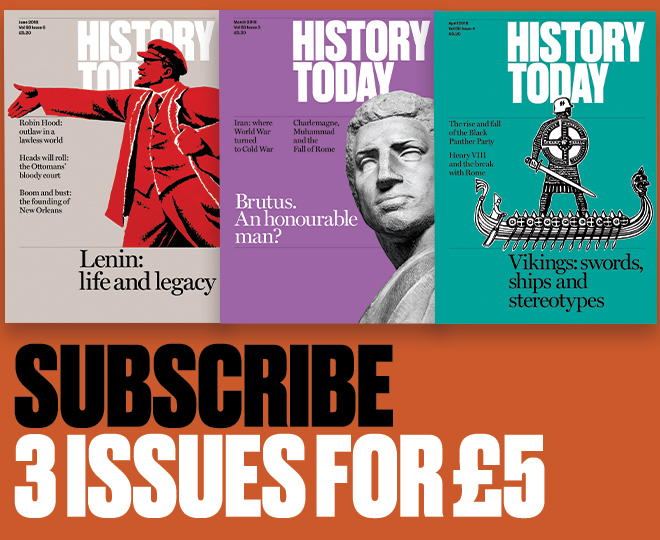 There is evidence, argues Adrian Tronson, to suggest that the 13th-century Mali empire, and its ruler Sundiata, were strongly influenced by the life of Alexander the Great, 356-323 BC, an influence that was to be capitalised on in the late 1950s. Accounts of the life of Alexander the Great exist in the literary and oral traditions of societies as far afield as Iceland, Ethiopia and Indonesia: this is well known. However, Alexander's 'afterlife' in the oral traditions of the Mandirika peoples of Senegal, Guinea, Mali and the Ivory Coast should be recognised, since it may be said to have influenced to some degree the political destiny of that region. 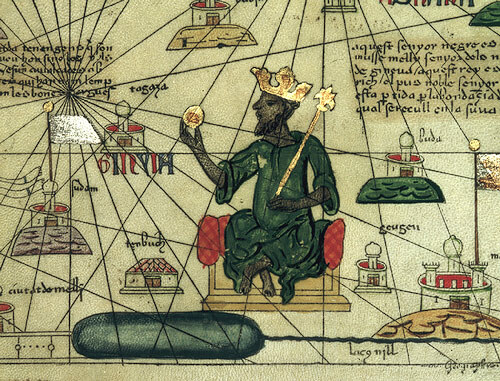 In the thirteenth century, Sundiata Keita, a local chieftain of an obscure Mandinke tribe in the north-west corner of what is today Guinea, inspired by the tales of Alexander the Great, which he had heard as a child from traders from across the Sahara, embarked on a programme of military conquest. His campaigns resulted in the unification of the Mandinke tribes and in the foundation of the Mali Empire, one of the most powerful and wealthy African states in the history of that continent. It endured for over two hundred years and was one of the few African kingdoms, apart from Egypt and Ethiopia, which featured on European maps of Africa, in the Middle Ages. The sources which deal with the life of Sundiata, consist of a brief reference by Ibn Khaldoun, in his History of the Berbers (written in the fifteenth century), and Mandinke oral traditions, of which the most accessible is the so-called Mali Epic . In the late 1950s a distant descendant of Sundiata, Modibo Keita, a leading figure in the post-war independence movement of the French Soudan, capitalised on the exploits of his ancestor, in order to advance his political ambitions. This propaganda campaign was partially responsible for the foundation, at the end of 1959, of the Mali Federation, comprising the present-day Republic of Mali and Senegal, and named, it should be noticed, after Sundiata's fourteenth-century empire. The Federation was founded through the combined efforts of Modibo Keita and Leopold Senghor of Senegal, but lasted only a few months. Keita was president of the short-lived Federation but continued to hold the presidency of the Mali Republic until 1967. The Sundiata-propaganda which accompanied the founding of the Mali Federation is not without interest to the classicist and ancient historian. Apart from a gramophone record, issued by a French recording company around 1960, which features a tribal bard (griot ) singing about Sundiata's exploits and comparing him with Alexander the Great, the item which deserves particular attention is the Mali Epic , or Sundiata , which was published in French in 1960 and in English in 1965. Its author- compiler, the West African historian, Djibril Tausir Niane, maintains that it is virtually a transcription of a recitation of one griot, whose family had been closely linked with, and in the service of, the Keita clan in the capacity of praise singers, since the time of Sundiata. The epic, which deals with the hero's birth, childhood, wanderings, battles and triumphs, is alleged to have been handed down, virtually unchanged, since the fourteenth century. On reading the epic one is struck by the frequent references to Djoula Kara Naini , the Mandinke corruption of Dhu'l Quarnein, the horned Alexander of the Middle Eastern romance tradition, the sixth great conqueror of the world and the defender of civilisation against the forces of Gog and Magog, who is mentioned in the seventh book of the History of the Jewish War of Josephus (ch 7) and in the eighteenth Shura of the Qur'an. On three occasions in the epic, Sundiata is referred to as 'shield', 'bulwark' and 'seventh and last conqueror of the world', excelling Djoula Kara Naini , respectively. There are two explicit references in the epic to Sundiata's admiration for Alexander: as a child, at the feet of his griot, he 'listened enraptured to the history of Djoula Kara Naini , the mighty king of gold and silver, whose sun shone over half the world'. Years later, while on campaign, he listened to the holy men who 'often related to him the history of Djoula Kara Naini , and several other heroes, but of all of them Sundiata preferred Djoula Kara Naini the king of gold and silver, who crossed the world from west to east: he wanted to outdo his prototype both in the extent of his territory and wealth of his treasury'. The latter quotation itself suggests an instance of Sundiata's 'imitation': that is, his preference for the tales about Alexander corresponds to Alexander's preference for the Iliad and for its hero whom he emulated. Indeed, Plutarch, in the seventh chapter of his life of Alexander, relates that Alexander used the Iliad as a vade mecum on his campaigns and kept it in a special casket. Alexander's emulation of Achilles is attested in all the extant Alexander histories. By examining the contents of the Sundiata epic, the instances where biographical details, the actions and behaviour of Sundiata seem to bear an obvious similarity to those of Alexander, as they are related in the various sources, the reader may detect both the nature and extent of Sundiata's Alexandri aemulatio . Granting that the points of resemblance are deliberate and not coincidental, the epic actually appears to imitate the Alexander romance as regards structure and content. ... as the child fell to the ground, lightning flashed suddenly, thunder began to rumble, the ground shook and all the heavens were moved. és of Ghana were the most powerful of princes. They were descended from Djoula Kara Naini, the king of gold and silver.... At the time of Sundiata the descendants of Djoula Kara Naini were paying tribute to the king of Sosso. It should be noticed how the epic casts the 'new Alexander' in the role of the avenger of his model's descendants. As a result of these exploits, it seems, Philip loved his son to such a degree that he was delighted to hear the Macedonians call Alexander their king and Philip their general. Moussa Tounkara was a great warrior and therefore he admired strength, When Sundiata was fifteen the king took him with him on campaign. Sundiata astonished the whole army with his strength and his dash in the charge. In the course of the skirmish... he hurled himself on the enemy with such. vehemence that the king feared for his life.... The king saw with rapture how the youth sowed panic among the enemy. As a result the king made Sundiata his viceroy 'and in the king's absence it was Sundiata who ruled'. Alexander too, at the same age, served as regent of Macedonia in Philip's absence. Sundiata's first major battle, in the capacity of commander, was against the Sosso. This corresponds to Alexander's first battle against the Persians, at the river Granicus (334 BC). Both battles were fought in order to gain access to the enemy's home territory. The Macedonians arrive late in the day at the bank of the Granicus. Alexander is advised not to attempt a crossing because of the lateness of the hour and the large numbers of the enemy. When Parmenio (the general) would not allow him to run the risk, on the grounds that the hour was late, he said that the Hellespont would be ashamed, if after crossing it, he were to be afraid of the Granicus and he plunged into the river with thirteen detachments of Cavalry. In the Mali epic, Sundiata, after marching all day, arrives in the evening at the head of the valley which leads into the country of the Sosso. The sides of the valley were black with men... his generals urged him to wait until the next day because the troops were tired and they were outnumbered. Sundiata laughed... no mere men could prevent him from reaching Mali... the battle would not last long... orders were given, the drums began to beat; on his proud horse, Sundiata... drew his sword and led the charge, shouting his war-cry. Then, with trumpets sounding, Alexander leaped on his horse... and himself leading the right wing, began the crossing. During the battle, Alexander engages in single combat with the satrap of Ionia, a kinsman of Darius the king. Sundiata, on the other hand, engages with the son of the Sosso king. The main point of the comparison is that Alexander and Sundiata, in the first great battles of their respective careers, do not engage with the enemy king, but with his deputy. The barbarians hurled so great a number of missiles that they collided with each other, so dense was their flight. while the epic relates that 'The arrows shot into the sky and fell thickly like iron rain'. Diodorus, in his account of the deployment of Alexander's forces at Issus (ch 33) says that Alexander sets his cavalry along the front of his whole army. This unusual formation is not attested in any other source for any other of Alexander's pitched battles. The epic, on the other hand, describes Sundiata adopting for his second battle 'a very original deployment', for he formed 'his infantry into a tight square, with his cavalry drawn up all along the front'. Perhaps this 'imitation' of Alexander's tactics is more than coincidental. There are also similarities in the accounts of Sundiata's third and decisive battle against the Sosso, and that of Alexander at Gaugamala (331 BC). Both battles begin when the sun is already high. Sundiata's and Alexander's forces are both outnumbered, bird omens appear either before or during the fighting and both Sundiata and Alexander pursue the enemy king for a day and a night and fail to take him alive. There are other points of comparison which deserve attention. Sundiata's life-long friend, Manding Bory, who accompanies him into exile, is his second-in-command on campaign and eventually becomes vizier of his empire, plays a role similar to that of Hephaestion. There is also Sundiata's war horse, Daffeke, who plays a role similar to that of Bucephalus. Sundiata undertakes a pilgrimage to a sacred mountain spring in the desert, just as Alexander visits the desert oracle of Ammon at the oasis of Siwah, and returns invested with a divine radiance and increased magical powers. Alexander returns from Siwah with the oracle's recognition of his divine parentage. Sundiata assumes the robes of a Muslim Mansa when he organises his empire, while Alexander assumes Persian garb after defeating Darius. Both Sundiata and Alexander, in the organisation of their empires, incorporate the young men of the defeated enemy into their armies and train them as cadets. The 'Romance' of Alexander the Great was widespread in the Middle East in the Hellenistic and Roman eras. The existence of the Mali epic shows how the exploits of the Macedonian conqueror, having been spread to the lands of the Niger by the trans-Saharan traders, captured the imagination of a people, remote from Hellenistic culture, even to the extent that a West African tribe claimed descent from him, that a thirteenth-century chief founded an empire by imitating him, and that his distant descendant by 'imitating' Sundiata and by using as propaganda the 'official history' of the Keita clan, which appeared to have been modelled after the Alexander Romance, somehow involved Alexander the Great in twentieth-century African politics. * Translations are by G.D. Pickett (Sundiata: an epic of Old Mali by D.T. Niane, Longman, 1956). A. Mazrui, 'Ancient Greece in African Political Thought', Présence Africaine vol 22, 1967.